PROGRESSIVE JACKPOT + 9 BONUS FEATURES! 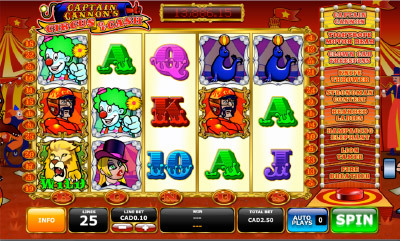 Captain Cannon’s Circus of Cash Progressive Slot at Fly Casini will soar you to jackpot fun! This new progressive slot at Fly Casino features 5-reels and 25-paylines that is filled with 9 bonus features! This is a 5-reel, 20-payline game at Fly Casino celebrates all the lights and fun of Las Vegas. 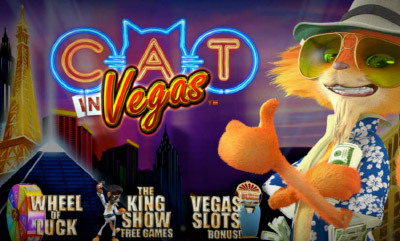 Felix, the party-going Cat in Vegas is the main character and he will take you around town to cash-in!. The Cat in Vegas progressive is seeded at $15,000 with the amount increased by every bet made on the game. To win the progressive, you’ll need to get the Slot Machine symbols anywhere on reels 1, 3 and 5 to the trigger the Vegas Slots Bonus. Once inside the second-screen bonus, keep checking the meter above each of the four machines and if all the bars light up, the jackpot prize is yours. 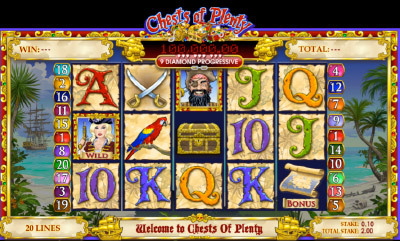 Chests of Plenty at Fly Casino is a themed progressive slot featuring Pirates. The Treasure Map symbol and the Treasure Chest symbols act as the scatter symbols, while Chesty, the female pirate is the wild symbol. Chesty will award you with 10,000 coins if you land five of her on an active payline. In addition, if the Male Pirate appears beside her on the reels, then he is automatically becomes a wild to add to the excitement. Other symbols include a Pirate Captain, Pirate Swords, and Parrots, as the theme is well done throughout the game and on the reels via awesome graphics.